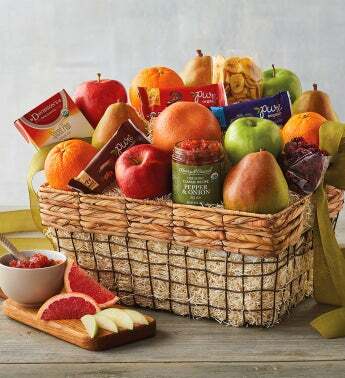 Send a basket laden with high-quality organic fruit and snacks. There is plenty of mouth-watering fruit, such as juicy premium pears, crisp apples, and sweet oranges, along with a host of tempting treats like our Organic Pepper and Onion Relish, banana chips, and dried cranberries. The fruit is grown, harvested, and packed in accordance with the USDA National Organic Program. The wooden basket will come in handy long after the treats have been savored.